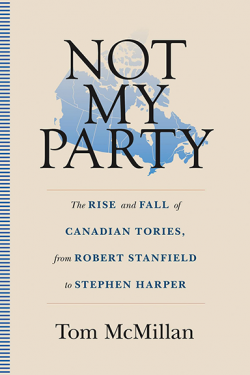 Tom McMillan, Not My Party: The Rise and Fall of Canadian Tories, from Robert Stanfield to Stephen Harper. Halifax: Nimbus Publishing, 2016. 600 pages. Okay, it’s not an easy question. PEI’s cabinet ministers tend to have somewhat similar Celtic names, and few have made a major impact on the federal scene. However, one of them has written an interesting book. He is Tom McMillan, who served in two portfolios during the early years of the Mulroney government but lost his parliamentary seat in the 1988 election. McMillan’s book is called Not My Party. 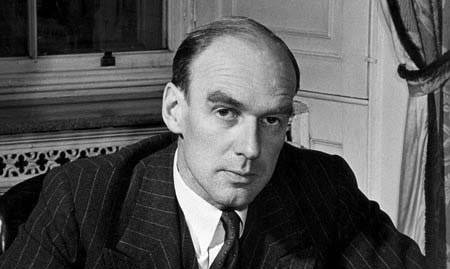 On the back of the dust jacket he laments that “the new Conservative Party is nothing I recognize as part of either my own political tradition or that of my family. Now, it is no longer my party. I am an orphan; I no longer have a political home.” This lament may lead readers to expect a critical analysis of the “new” Conservative Party that was founded and led by Stephen Harper, but in fact there is not much about Harper in this rather long book. Practically all of it is devoted to the years from 1967, when Robert Stanfield became leader of the Progressive Conservatives, to 1988, when the author lost his seat and retired from politics to serve, for the remainder of the Mulroney era, as the Canadian Consul General in Boston. The heroes of the book are Stanfield, “the best prime minister Canada never had”; Tom Symons, who was the first president of Trent University and assisted Stanfield in redefining the party’s program and policies; and Brian Mulroney. Stanfield and Symons were natural partners – both born to wealthy families, both somewhat shy, thoughtful and serious, and both, as McMillan tells us, motivated by a sense of noblesse oblige. Reading McMillan’s very detailed account of their partnership reinforces my wish that Stanfield really had become prime minister. Mulroney is a very different personality, but earned the author’s respect as a capable politician who was able to win elections and put much of the Stanfield-Symons program into effect, as well as making the party a serious force in Quebec. McMillan especially praises Mulroney for his interest in the environment, which is the portfolio that McMillan held for most of his four years in the government and about which he has a lot to say in his book. This is a side of Mulroney’s career that deserves to be remembered. McMillan is less kind to other recent Conservative chieftains, with the exception of Jean Charest, whom he likes. He despises John Diefenbaker as a “populist” with (according to McMillan) no ideas about policy, thinks Joe Clark was a nice guy but not much of a leader, and ridicules Kim Campbell (although acknowledging that she was “winsome”) for a trivial incident involving an ice cream cone. However, his real grievance against Campbell, which he rants about for several paragraphs, is that she promised to re-equip the Canadian armed forces with new helicopters. Rather oddly for a Tory, McMillan seems to think that the armed forces are a waste of money and that any politician who takes them seriously is somewhat un-Canadian. Peter MacKay, of course, is denounced as the man who sold out the party to Stephen Harper. Harper himself, although not discussed in any great detail, is the villain whom the audience is supposed to hiss when he appears on stage – the man who stole the party of John A. Macdonald from the “classic Canadian conservatives” (McMillan’s description of himself) and who Americanized Canadian politics. He makes invidious comments about American society and politics, but decided to spend his retirement in Boston after the end of his term as Consul General and was still living there when his book was published. He writes the usual nice things that politicians write about their wives, but admits near the end of the book that he and his wife divorced each other, for a reason that seems rather trivial, soon after his political career ended. There is quite a lot in the book about the bridge that now connects Prince Edward Island with the mainland or, as it is called in Islandspeak, the “fixed link.” Like Mulroney in his own memoirs, McMillan regards this piece of infrastructure as one of the Mulroney government’s greatest achievements, and even compares it to the building of the CPR. (Ironically the government that built the “fixed link” was also the one that ended passenger train service on the CPR’s main line.) He ridicules those islanders, of whom there were many, who opposed the project. Both Mulroney and McMillan claim that it did a lot for the island’s economy, although the evidence for this is rather sketchy. Mulroney even says in his memoirs that it became “a big tourist attraction in itself,” an accolade that might be more fairly bestowed on the ferry service which it replaced. Whether it was really worth a billion dollars at 1980s prices, at a time when the federal debt had reached a dangerous level and was growing rapidly, to build one of the world’s longest and highest bridges to serve fewer people than live in Oakville, Ontario, not all of whom thought it was a good idea, is a question readers may decide for themselves. McMillan does however have a valid point when he laments the disappearance of the old Progressive Conservative Party. He approvingly cites Hugh Segal’s 2011 book, The Right Balance: Canada’s Conservative Tradition. Segal differs from McMillan (and sounds more authentically Conservative) in arguing that Canada should have strong military forces, and he is more charitable in his assessment of Diefenbaker, but in other ways their views are similar. In the world in which Segal, McMillan and I grew up, one sometimes heard complaints that “the two old parties” were too much alike, but there was some virtue in the fact that they had much in common. Both supported our traditional institutions, including first-past-the-post voting and the appointed Senate. Both favoured a gradually expanding welfare state, to which both contributed; an economy with a mixture of state-owned and private enterprise; and a foreign policy backed by meaningful armed forces. Both thought the state should avoid cultural and “social” issues, apart from supporting two official languages. While they disagreed on the details, they were at least on the same wavelength, and talked about the same things. Today our politics are totally polarized and the parties not only disagree; they talk past each other. While the Liberals plumb the depths of cultural radicalism and political correctness, the Conservatives respond by chanting monotonously about lowering taxes and balancing the budget, two objectives that are not always compatible. As I pointed out a year ago in Inroads,1 essentially the same thing has happened in the United States. 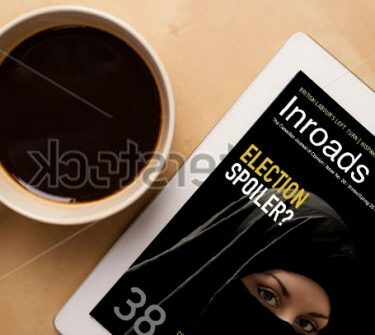 The political trends, fashions and practices in that country always appear in Canada within a few years, as has been true for most of our history. Whether we can ever return to the good old days is questionable, but at least books like Tom McMillan’s can remind us of what we have lost. 1 “We’ve Seen Trump’s Like Before,” Inroads, Summer/Fall 2017, pp. 10–15.